There are very few wardrobe essentials that are as classic and iconic as the white button-down shirt. You can dress it up, dress it down, effortlessly transition it from a daytime work look to a chic, nighttime getup. It’s minimal, versatile, effortless, and for me, makes me feel like the ultimate boss babe. You can find button-downs at most fashion retailers, but how often can you find one that actually fits? And for us conscious consumers, how often can you find one that’s Fair Trade, designed in the USA, and made out of organic cotton? 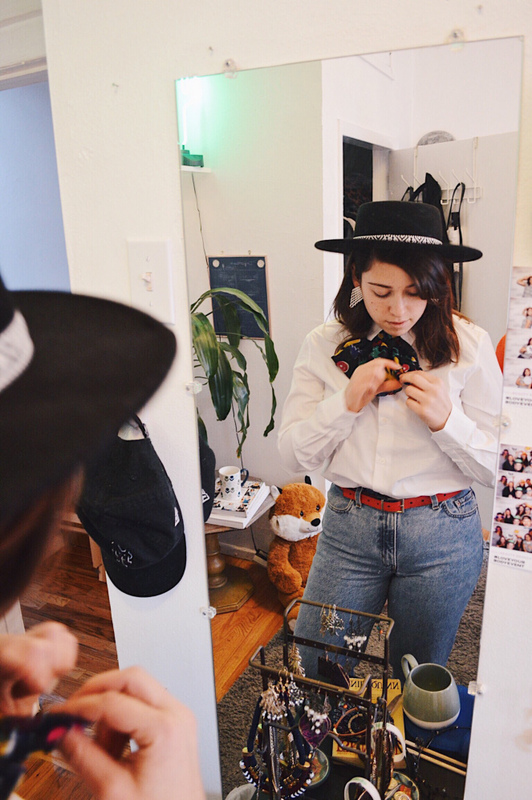 Enter Grammar NYC, a new to the scene small local business based in Brooklyn that is changing everything you once knew about the classic white button-down shirt. This game-changing company has taken a sustainable, modern-day spin on this timeless fashion staple, and after reading this post, I bet you’re going to want to take a spin in them, too. With their shirts made out of organic cotton that’s grown, spun, and woven in India and produced right here in NYC in the Garment District, sustainable style has never looked and felt so good. A few weeks back I was invited to check out Grammar’s studio space located in the Brooklyn Fashion & Design Accelerator, and as the sun was setting on this crisp winter day, the Grammar team and I gathered around a small table in their shared common space, tea in hand, to talk about the birth of this emerging brand and what’s on the horizon for them in 2018. Founder, CEO and Original Grammar Woman Althea Simons started the sustainable company out of the passion and desire to make quality clothing that women not only want, but need. She studied neuroscience at Brown, took classes in design at RISD, and studied art while abroad in Paris, so it’s safe to say that this budding entrepreneur and designer is a true Renaissance woman. It was while she was in Paris designing and making clothes that she began to fall in love with the idea of starting a fashion company. Althea knew, however, how brutal of a business the fashion industry could be, and was well aware that in order to make the product she wanted, she’d have to overcome quite a few hurdles. From finding organic cotton and an ethical factory to work with, to figuring out pricing and distribution, creating the perfect white shirt was no easy feat. Out of a burning passion, tireless work and research, and her successful Kickstarter, Grammar was born. Detail, quality, and consciousness is what separates this company from the others, and with Althea leading the way, you can expect a lot more mindful magic coming from this up-and-coming brand. As a woman with a size D bust, it can be hard, if not borderline impossible, to wear button-downs. There’s always that damn gap in the middle of the shirt that makes you look like a hot mess. So, when I was invited to try on their capsule collection of organic cotton shirts, I was extremely excited to hear that they were thoughtfully designed to compliment all different body types, and that the damn middle gap would be, well, damned. Althea guided me through each shirt style as I was trying them on, making sure to note the fun, little details that made each shirt unique. Out of the 5 styles, The Verb, The Preposition and The Conjunction fit me best, with The Conjunction being my absolute favorite. With its super sleek style, waist tie hugging my curves, and ample room for the ladies, The Conjunction and I were pure kismet. So, if your button-downs are looking like they might need a spellcheck, the gals at Grammar have got you covered. Be sure to give them some love on their Instagram account here, and check out their website for the full line of products here. I hope you enjoyed this post, and check out my style tips along with some more photos of these darling shirts below! This blog post was written in partnership with Grammar NYC. Some shirts look great tucked! I loved how The Verb looked tucked into my high-waisted vintage jeans. Need a pop of color? Add a bold, patterned scarf around the neck for a chic and personalized look. Because of the high necklines, I found that earrings compliments these shirts super well! I wore my long, dangly pairs. Don’t be afraid to keep it simple. Yes, I definitely paired quite a few accessories with the shirts in the photos below, but with each shirt presenting unique detailing and features, they look perfect on their own.